Most of the android users prefer third party browsers over the default Android browser because of their numerous benefits. 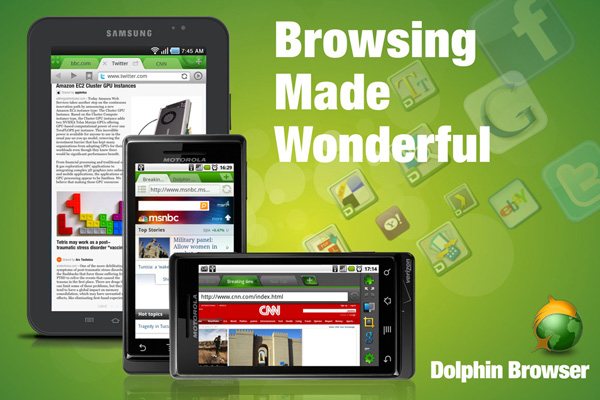 One such browser is - Dolphin Browser HD - which is first Voice, Gesture controlled browser for android. Wouldn't it be fun to command your browser what to do, to use gestures to navigate? Besides it has tabbed browsing similar to our favorite desktop browers like - Google Chrome, firefox etc. There are lots of add-ons like "Web to PDF", "Screen cut", "Battery Saver" etc that can make your browsing experience even better. In order to use the Gesture or Voice command function, by default there is a small button on the bottom left side of your screen(whose position can be adjusted later from the settings menu). Long-pressing this button will give user the choice to select between "Gesture" or "Voice Contorl". You can even add your own gestures to it. What's intriguing is the ability of Dolphin Browser to accurately understand users command just like Apple's Siri. Dolphin team has also added fsite-specific commands for some famous website - Facebook, eBay etc - so that you can easily jump between options. Dolphin Brower HD for Android is a free brower app that can be downloaded from the Android Market. I think this is the best browser for android. nice browser with good response. definitely better then the existing browsers.